The May 15 deadline for submittal of comments on the USDA proposal has now passed. The USDA will now review these comments and consider them. They will then issue the final proposal for voting. The comments to date have covered issues like handling of transportation costs and the need for a website with forms available. No deadlines or dates have yet been established for the final version and the voting process, but it will probably take months to organize and execute. When the USDA publishes the final document, it will require a two-thirds majority of the producers or two-thirds majority representation of the California milk production. The vote of the producers will probably be cast primarily by their cooperatives. To date, there is nothing that would suggest defeat of the effort to make California a FMMO. This blog post will examine some of the key points in the AMS published "Economic Analysis of the Recommended California FMMO." Their analysis covers not just the impact on California, but covers the impact on the pricing and production of all U.S. milk. As a Federal Order paid on components, California producers will be paid based on pounds of milk protein, pounds of butterfat, and pounds of other solids. The change in values of these components will impact not only California producers, but all U.S. orders paid on the component system. 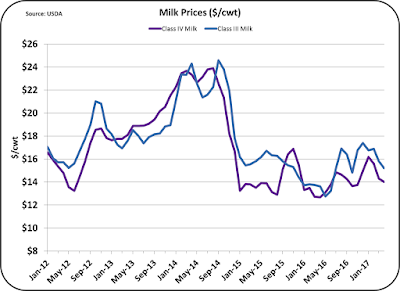 By the AMS projections, milk protein will increase in value by $.47/lb. Based on current values, that would mean an increase of slightly more than 25%. 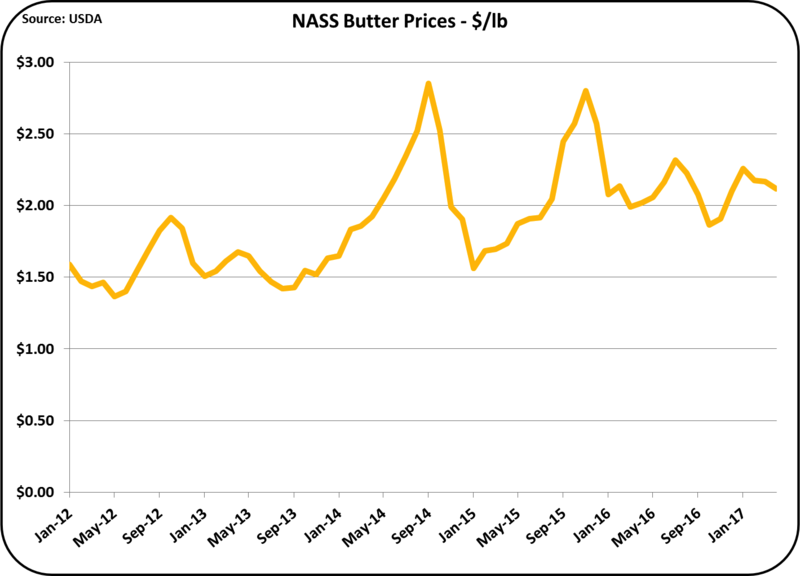 Butterfat would fall in value by $.26/lb. and other solids would increase by $.03/lb. The AMS reasons behind these significant component changes are based on changes in the class composition of California milk. The largest use of milk in California today is for making cheese (Class III milk). In 2016, 47% of California milk went to cheese making. Because California milk for cheese will be more expensive when priced by FMMO formulas, it will be less competitive. As a result, less cheese will be made in California. With less cheese made in California, the total cheese made in the U.S. will drop, causing cheese inventories to shrink and prices to increase. 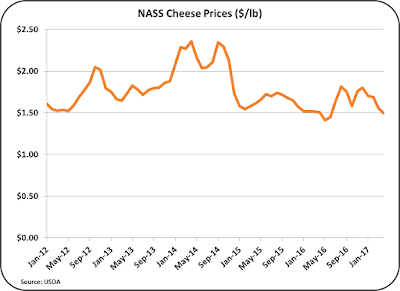 Higher prices for cheese translate into higher prices for milk protein for all orders. That leaves some California milk available for other uses. By the AMS analysis, that milk will be used as Class IV milk for butter and nonfat dry milk processing. 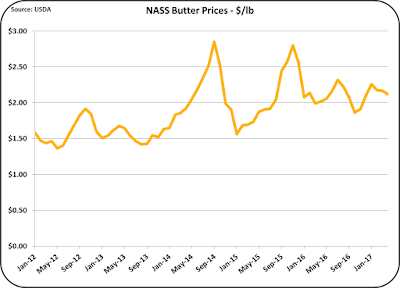 Because more butter will be available, the price of butter (and therefore butterfat) will drop. That will reduce butter imports and increase butter exports. 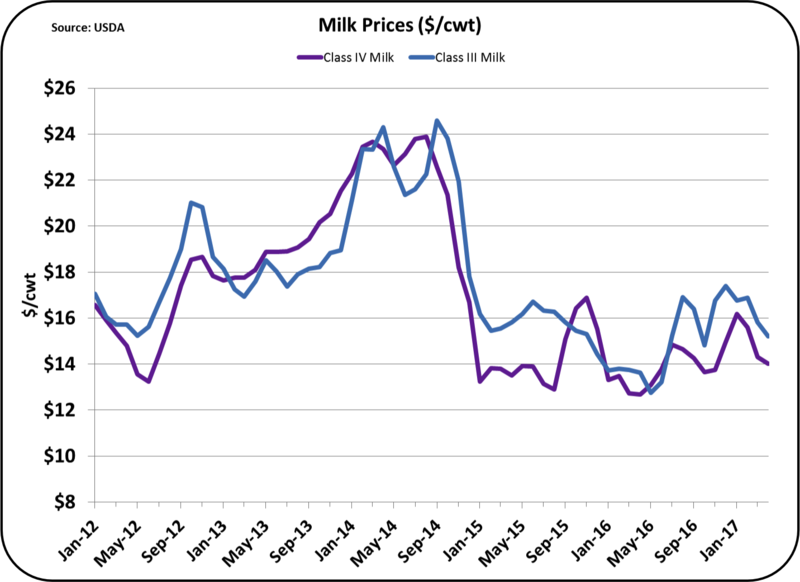 But, the real impact for milk pricing caused by the increased volume of Class IV pricing, will be to reduce the price of nonfat dry milk and butter. The additional nonfat dry milk will have to find a home in the international markets. If all other factors remained constant, that would mean a decrease in the value of nonfat dried milk. By the Federal Order formulas, a lower butter price will also impact the price of milk protein. By the formulas used, when butterfat is more valuable when used in cheese rather than butter, the value of milk protein goes up. That is part of the reason for the significant price increase in milk protein. The AMS impact on Other Solids pricing comes from supply and demand for dried whey. 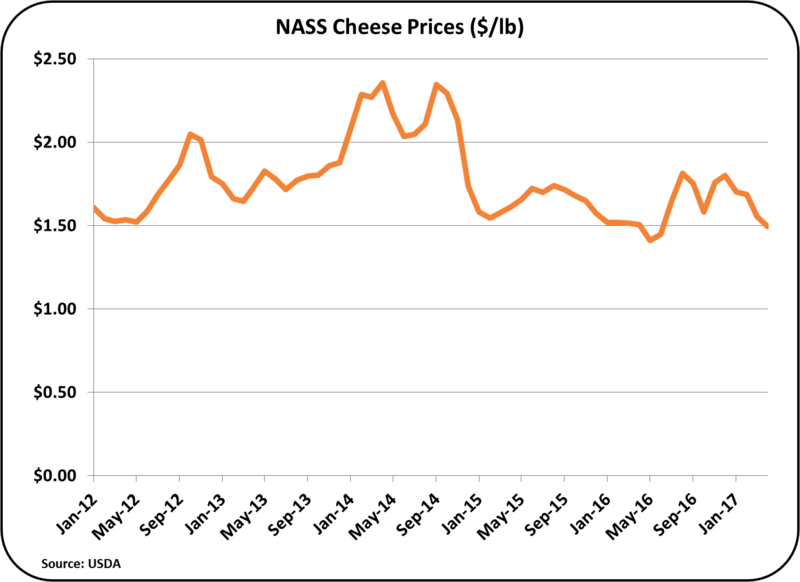 With lower cheese production, less whey will be available for drying and therefore the price of dry whey will increase. What does the AMS not take into account? Currently, much of the California milk used for cheese receives an above minimum bonus for milk protein levels above threshold levels. Will these private incentives for protein production be revised? Cheese producers in other Federal Orders like the Upper Midwest pay similar bonuses for higher protein levels. It is likely that bonuses for protein production in California will be revised to be competitive with bonus plans in other orders. Public information on these bonuses is not available as they are based on private business arrangements between producers and processors. If California becomes a FMMO, producers will also receive a Producer Price Differential. The Producer Price Differential is based on the difference between the uniform milk price, a weighted average of the four milk classes, and the Class III price. Producer Price Differentials are calculated individually for each order paid on components. The California producer price differential is not specifically covered in the AMS model. In theory, with reduced Class III California milk and a significant increase of lower priced Class IV milk production, the California FMMO uniform price would be close to the Class III price and sometimes below the Class III price, minimizing the producer price differential. It may at times cause the producer price differential to be negative. However, California Class II, III, and IV milk can be de-pooled in California when it becomes a Federal Order. De-pooling was not allowed under the California pricing system. De-pooling allows the producers milk to not be included in the FMMO pricing program. Producers typically de-pool when the producer price differential is negative. The de-pooling does not impact the price of nonfat dry milk used for pricing Class IV skim milk, because the price is determined by international supply and demand. However, the de-pooling will impact the volume of Class IV milk used in the calculation of the uniform price. If the Class by Class volume changes are as forecast by the AMS model, the producer price differential for California will be minimal. For more detail on the AMS economic impact report see my recent article in Progressive Dairyman - and the AMS Economic Impact document. 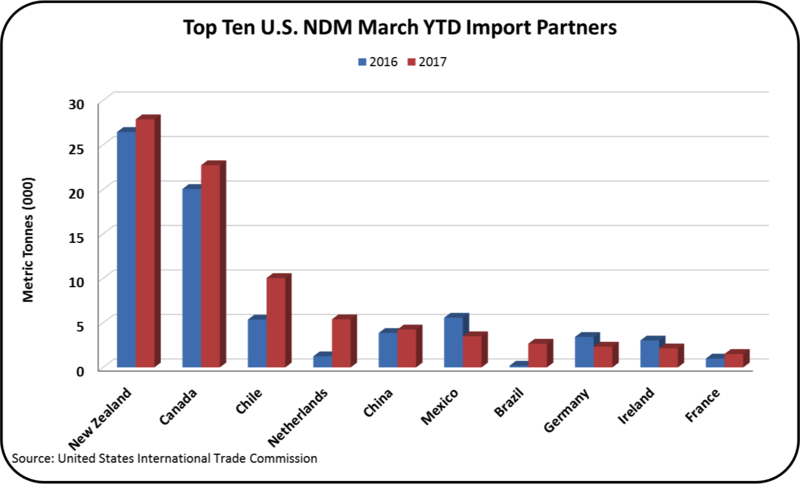 In the first quarter of 2017, 14% of U.S. dairy solids were exported. This is a significant increase from the first quarter of 2016 when 12.6% of U.S. dairy solids were exported, but still well below the previous highs of 2014 and 2015. 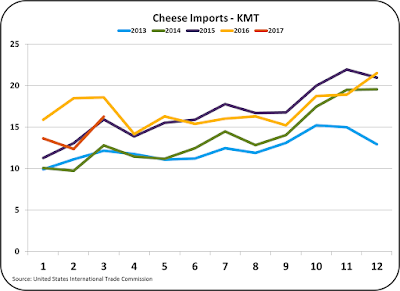 Cheese, NDM, and dry whey net exports (exports minus imports) were all up over the prior year. 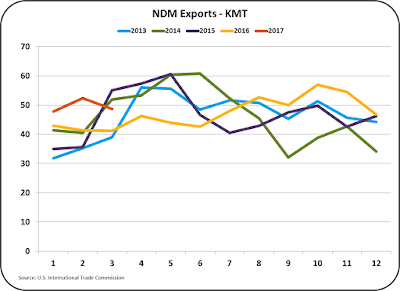 Butter exports were very low and imports were up, resulting in a lower and negative net export level compared to the prior year. 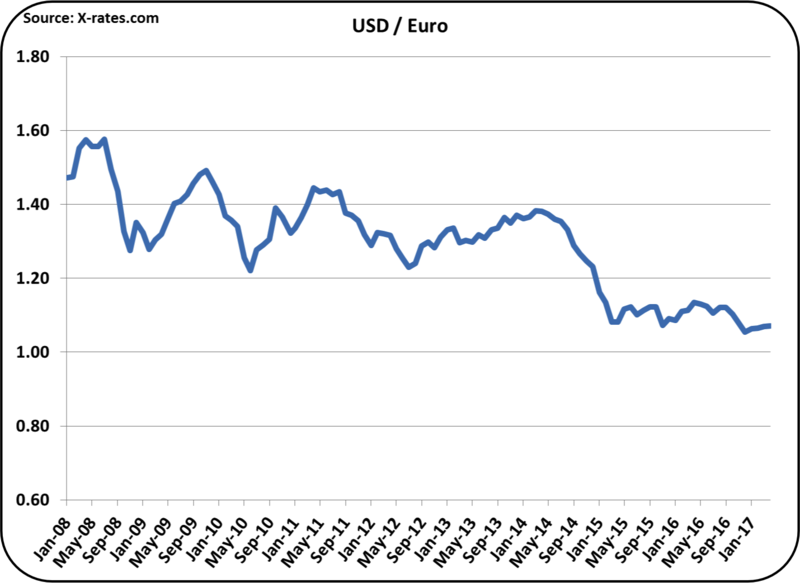 The improvements are especially significant considering the headwinds caused by a strong USD, which mostly remains unchanged from the prior year. 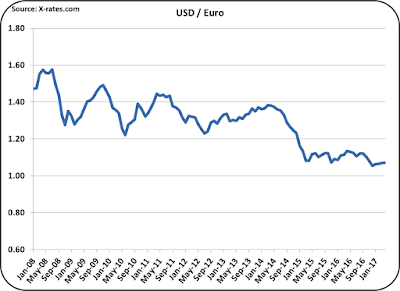 The most significant exchange rate is the USD/Euro. This exchange rate fell continuously from 2008 to 2014 and then took a plunge. It remained stable through most of 2016 at an average rate of around $1.12 and then took another fall in late 2016 to the $1.06 level. A strong USD makes U.S. products more expensive in the international markets. 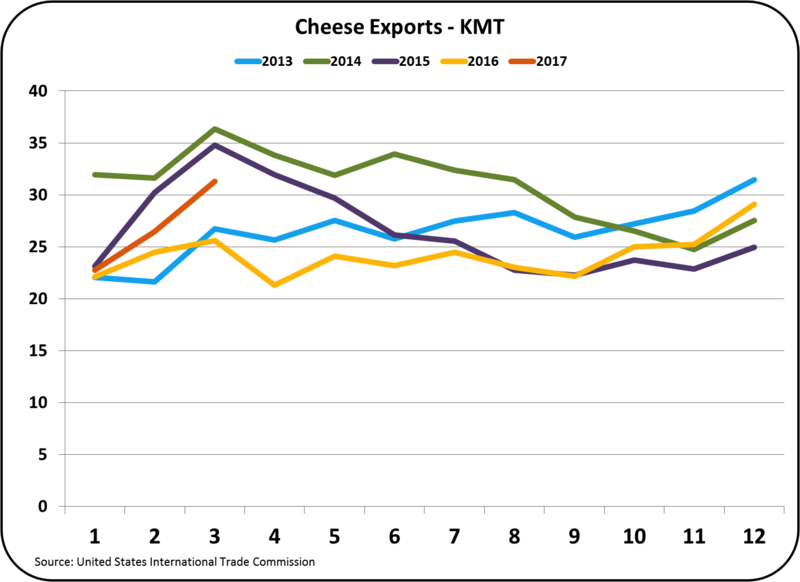 Cheese exports have improved from 2016, but still lag behind 2014 and 2015 in volume. 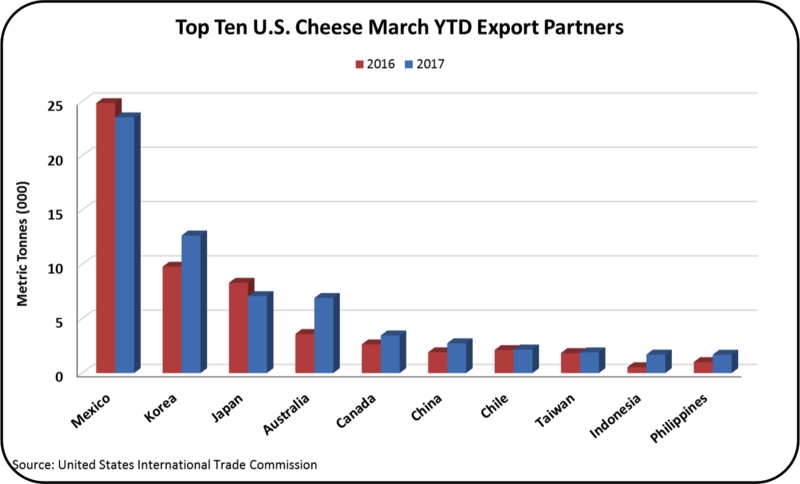 For the first quarter of 2017, cheese exports have increased from 5.3% in 2016 to 5.8% of production. 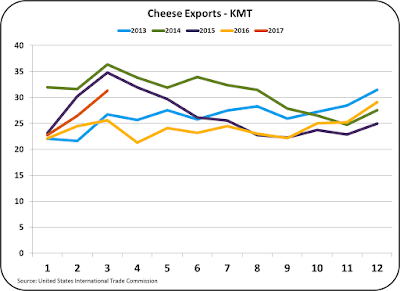 The increased level of cheese exports have resulted from increased exports to South Korea and Australia. Exports to Mexico still slightly lag from the prior year. 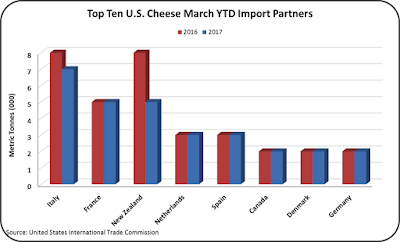 Imports of cheese are down significantly from 2016. International cheese prices have increased making them less attractive to U.S. cheese buyers. 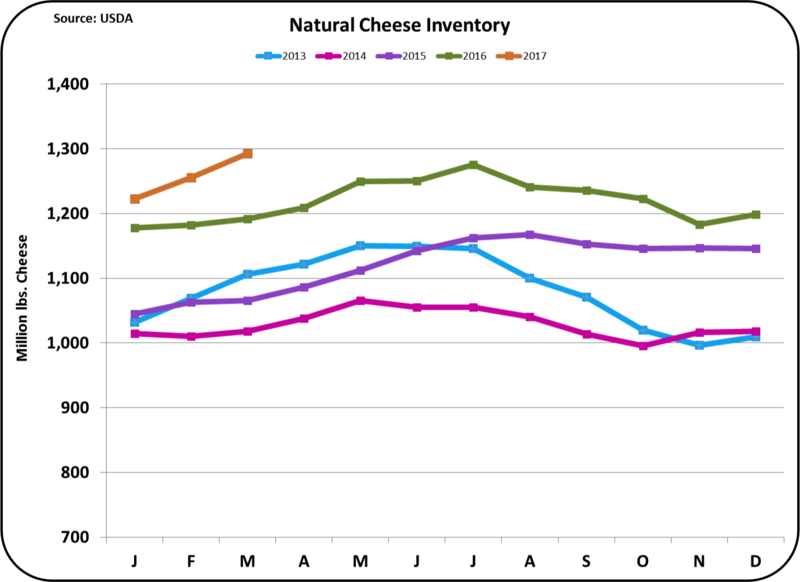 In the first quarter of 2017, New Zealand cheese prices increased 23% vs. the prior year. 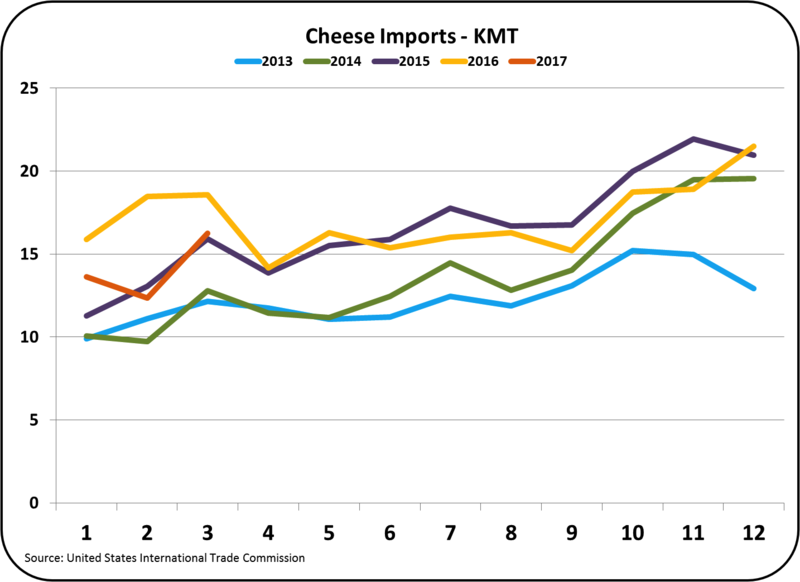 The impact is very visible in the graph below as imports of cheese from New Zealand have taken a significant fall. 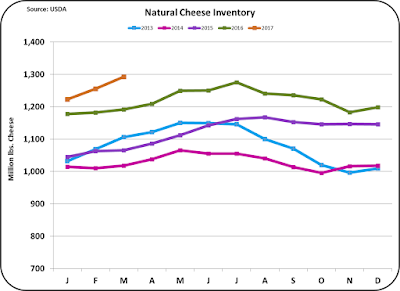 As mentioned in the prior post, cheese inventories are still high and this is keeping the cheese price low. However, exports and imports of cheese are currently on a favorable trend that should lower the inventories and improve prices. Because the international markets can be significantly influenced by many external factors such as world supply and demand, exchange rates, political events, etc., there is always a high level of uncertainty in international forecasts, however, for now, the trends look encouraging. 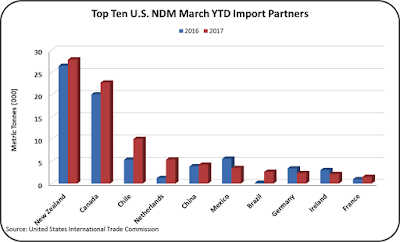 The largest export product for the U.S. is NDM/SMP. ( The difference between NDM and SMP were explained in a prior post.) 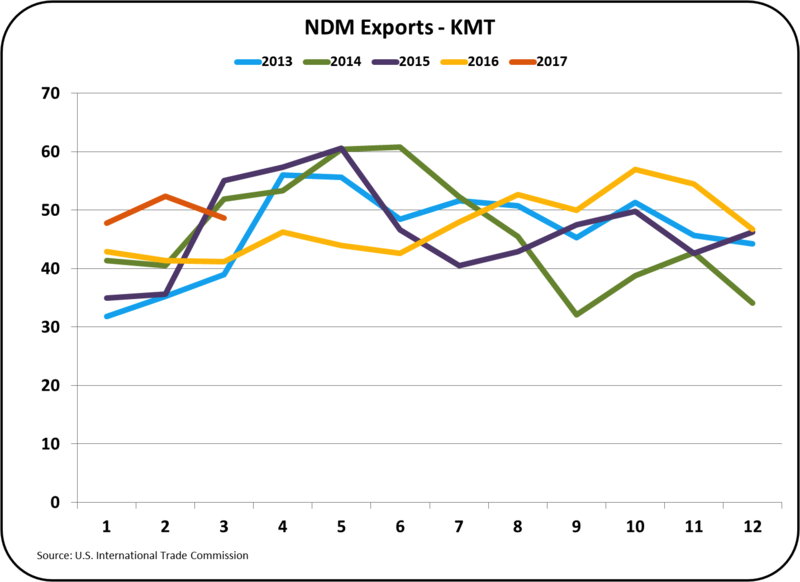 For the first quarter of 2017, NDM exports were at record levels. However, imports were also at record levels for the fist quarter of 2017. The imports came from many sources, as shown below. 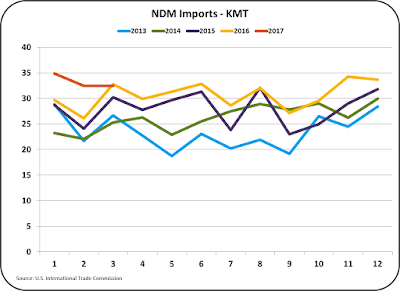 Prices of NDM have fallen during 2017 as international supplies remain strong. 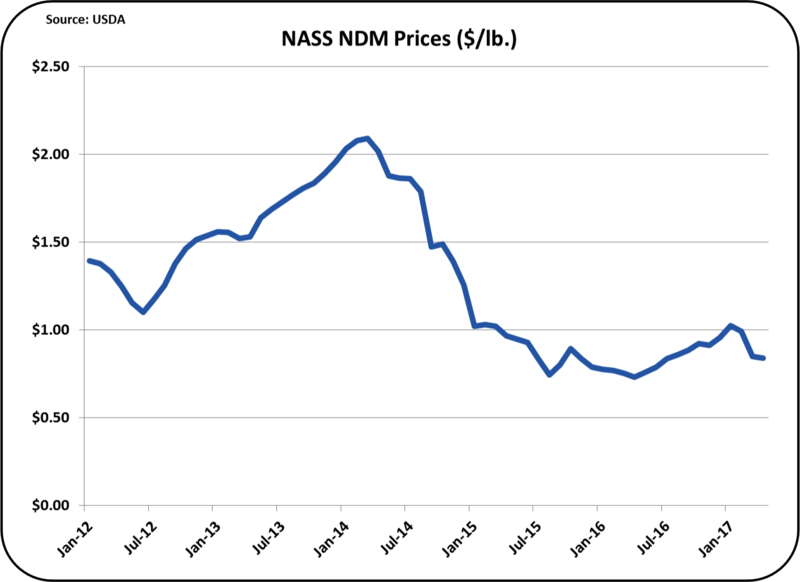 Because domestic butter consumption is up, there are significant volumes of skimmed milk available for production of NDM/SMP. 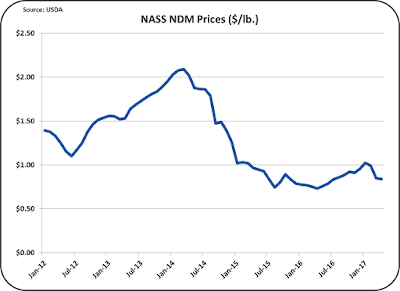 This is keeping NDM/SMP prices low and probably will continue to keep NDM/SMP prices low. 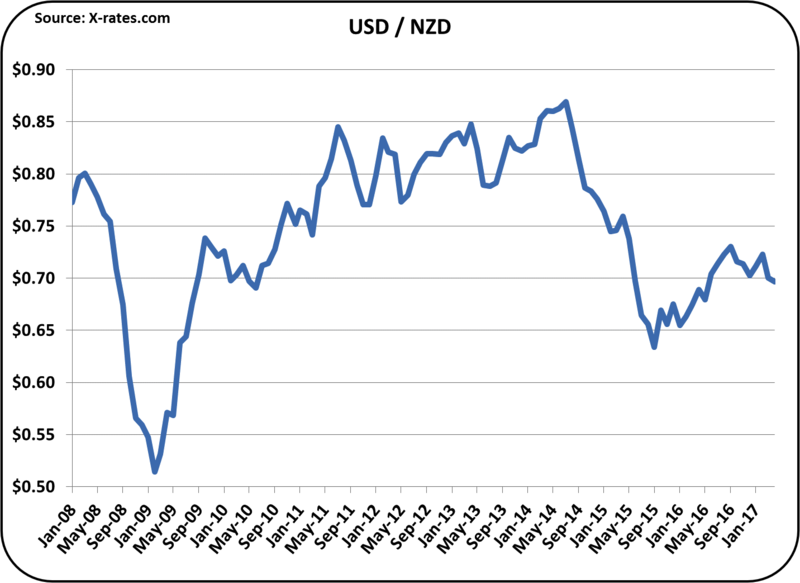 The USD has weakened vs. the NZD in 2016, favoring U.S. exports. However, for the last few months this has reversed. 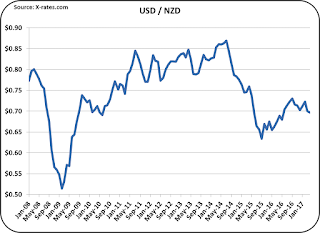 If the USD continues to strengthen against the NZD, the U.S. price of NDM may fall further to remain competitive with New Zealand. It seems certain that the international market for dairy products will remain very active and price competitive in the future. 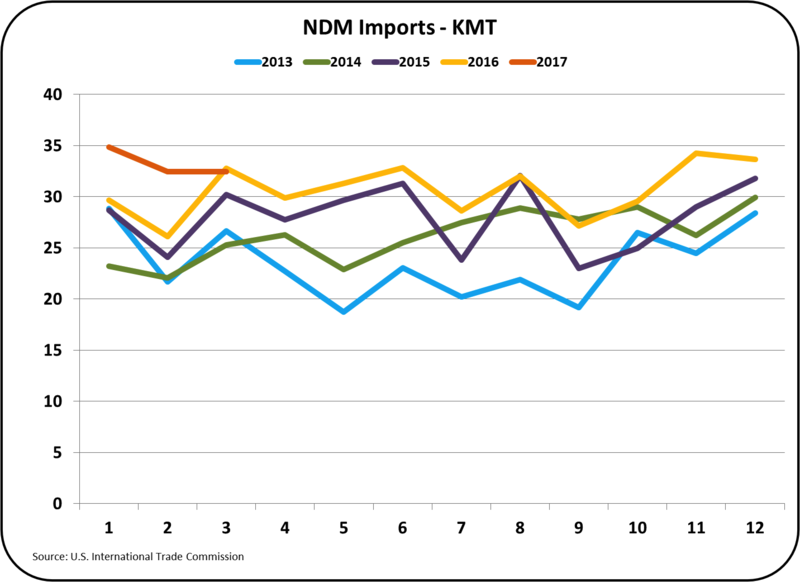 So far in 2017, 54% of nonfat dry milk/skimmed milk powder produced in the U.S. has been exported, so the domestic price of nonfat dry milk is determined primarily by the international markets. 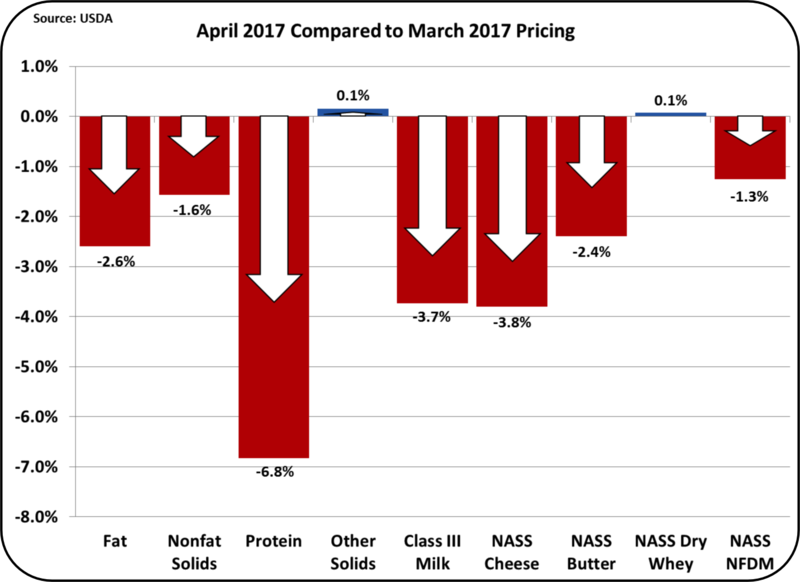 The two major factors influencing producer prices for 2017 are the international dairy markets and the possible transition of California to a FMMO. The financial analysis of the California change will be reviewed in the next blog post.